Setting the Standard in Comics!! I began commissioning comic art in 2010 and quickly settled into pieces featuring old public domain superheroes with the idea that “Standard Comics” (a real company until the 1950’s) bought all these characters and published them together in a shared universe. Eventually my own creations crept into the mix. Basically, the idea was that each of the fake covers or interiors to these imaginary comics were a sort of window into another universe where the heroes of “Standard Comics” were as famous as those at DC or Marvel. The first result of this was the Standard Comics Encyclopedia (see Current Projects). is the next issue in the series, following on the heels of the “Forced Labor” comic successfully funded via a Kickstarter campaign! A comic book featuring fantastic new heroes and villains. I hope that adults enjoy the book, and read it to, and with, their kids. It’s not a retro, tongue-in-cheek book, just good solid heroic adventure for the whole family. Once all the backers have their rewards, it will be available on IndyPlanet. Written by Roy Johnson (Author of “The Standard Comics Encyclopedia (Abridged)” and “Forced Labor”). Illustrated by Luis Rivera. Luis is a penciller and inker, having worked for Old Skull Comics, Pilot Studios, and Standard Comics who brings an old-school (as in, “old school is the best school”) look to his work. 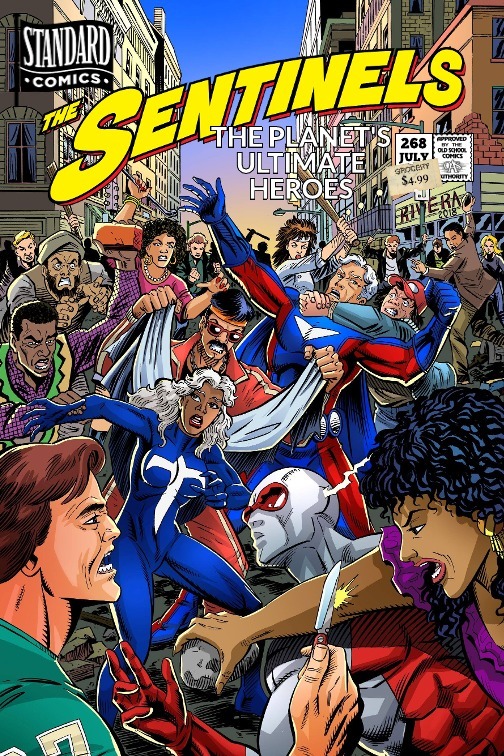 A one-and-done story featuring Optima, UltraMan, Raven, Crimson Streak (who’s appearing in Coalition Comics‘ Power Company series), and some of the other members of the Planet’s Ultimate Super-Heroes, the Sentinels.